If you have enjoyed reading my blog posts then you will enjoy reading about the very special postcards I have reserved for this new book. I am pleased to announce the upcoming release of my book "Just to let you know I'm still alive". The title is drawn from the opening line of many handwritten messages made by soldiers on the back of postcards during the First World War. This publication is due in New Zealand bookshops after 1 August. This book takes the reader on a journey into the colourful world of the picture postcard during World War One when the form of communicating was to mail a postcard with a message on the reverse side to a loved one serving on the battlefields of Europe. They were the emails of yesteryear, the economic way to communicate with family and friends across the miles. When war was declared in 1914, postcards took on a more meaningful purpose on a scale not seen before. Beyond their heart-filled personal messages to and from the battlefront, postcards also became a patriotic and propaganda tool. The Dominion of New Zealand was quick to rally and answer the call to serve King and Country and it was not long before New Zealand publishers were producing original works by New Zealand artists and photographers for the local market. They were cherished as prized possessions for their photographs and art and became collectables in private postcard collections. 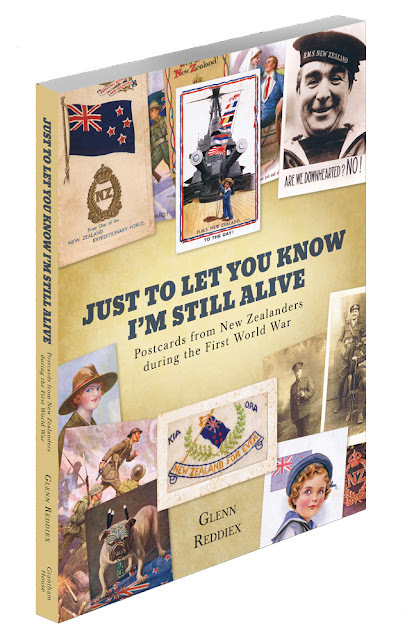 These wonderful and thought provoking postcards with their handwritten messages give a poignant insight into the life and times in New Zealand during the Great War. My special thanks to Grantham House Publishing and to all those who have supported me in my research.